Inspired by the winningest motocross rider in history, King of Supercross – Jeremy McGrath, the SX500 McGrath features authentic McGrath graphics and fairing design, genuine dirt bike frame geometry and a high-torque, variable speed motor for a super-charged experience. Features dual suspension and riser handlebars, large pneumatic knobby tires, retractable kickstand, and hand operated dual disc brakes. offer you the perfect product for little champions! Motorcycle spec tires with front- and rear-specific tread, disc brakes and dual suspension make this electric ride ready to rock the dirt. 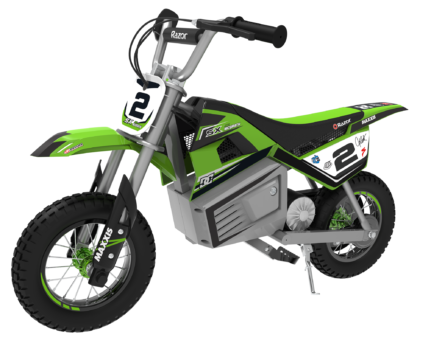 Fun Bike to own!Super nice dirt bikes for kids! If you are having second thoughts, don't hesitate to buy. These bikes are really nice and take minutes to assemble just a few parts. Buy a helmet, gloves and knee and arm pads because these bikes are fast! They are excellent to learn how to ride and very easy maintenance. Awesome bikes!